Sweet and savoury Vietnamese caramel salmon in a banh mi stuffed with pickles carrots and daikon radish cucumber, jalapenos and cilantro. I recently realized that it has been quite a while since I last did anything with seafood which is kind of disappointing considering how much I enjoy it. 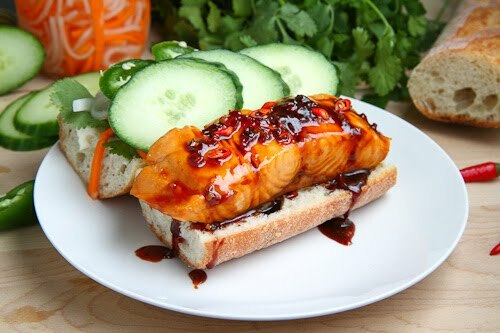 In order to resolve the problem I pulled out this idea for a Vietnamese style caramel salmon banh mi which has been on the back of my mind for even longer. When I first came across the idea of using caramel in a savoury dish in Vietnamese cuisine I was immediately curious and tried it only to be surprised at how well it really does work! I have been using the Vietnamese style caramel sauce ever since, using it in a number of dishes and I figured that it would go really well on creamy salmon and that that would go well in a tasty banh mi sandwich! This recipe starts out by simmering sugar and water in a pan until it turns a deep golden brown when you add some more liquid to turn the thickened caramel into a sauce. The sauce is then seasoned with fish sauce, lime juice, garlic, shallots and chilies for some heat. Really at this point you could throw anything into the sauce and it would come out amazing but this time it was salmon. The moist, tender and buttery salmon goes so well in the caramel sauce! It is just packed with flavour and the spicy heat from the birds eye chili is perfect. 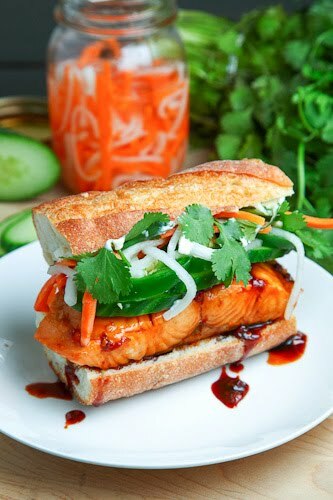 Of course, things only get better when you put the caramel salmon into a banh mi sandwich with cucumber, jalapenos, pickled daikon radish and carrots along with mayo and plenty of fresh cilantro! One thing that I did not count on was just how big these sandwiches were going to be! Open wide! Moist, tender and creamy salmon cooked in a sweet and savoury Vietnamese caramel sauce. Heat the water and sugar over medium heat and simmer until it turns a deep golden brown. Add the salmon and simmer until cooked, about 2-3 minutes per side and set aside. Serve the salmon along with the reduced and thickened sauce poured over it. Wow, that is the prettiest salmon I have ever seen! This looks simply amazing. Thank you! How interesting! I have a more traditional banh mi recipe planned for this weekend, but I'm tempted to add that Vietnamese caramel sauce. Sounds intriguing! we are going to give this one a try. we love bahn mi and have been making the recipe from not without salt lately.the addition of her siracha mayonnaise to your salmon is making my mouth water! This looks amazing! I haven't had Banh mi since I went to Vietnam. I seriously need to try this! This looks so good! Really wish I would have read this before I prepared the same boring salmon tonight! Love the caramel sauce addition! A fantastic bahn mi! This salmon version is gorgeous. I've made vietnamese caramel sauce before and you're right…it would go utterly perfectly against salmon's creamy butteryness! This looks awesome and must be delicious! Gotta admit I'm not much a seafood lover but this looks pretty damn tasty. Keep it up. Cheers! Wow, this sounds delicious and caramel sauce oh my! oh that looks SO good!! the sauce sounds just spectabular! thanks for sharing! Gorgeous photo! This reminds me of a Vietnamese caramel sauce I made for pork fillet a while ago, but I bet it would be even better with salmon. Such an inspired idea! Hey Kevin, did you give permission for this? http://foodporn.it/post/25233339147 – just turned up in my twitter feed! Your sandwich looks better in the original pic on your site! Another delicious salmon recipe to try Kevin! These are stunning photos, Kevin. I am a huge fan of salmon in any fashion and these are definitely calling my name! Beautiful! I wonder if flaking the salmon would make a more manageable mouthful? It certainly wouldn't change the flavor. I'm always astonished at how you combine flavors and cuisines. This looks sooo yummy. I <3 Banh Mi but haven't had it in a while since going gluten free. Might have to search for GF hoagie rolls, or just forget the bread altogether. It looks worth it. Great idea! Terry C: Yes flaking the salmon made the sandwiches much easier to eat. I made this recipe last night Kevin-well, sort of!! I made the sauce and used it as a glaze for my salmon, which I grilled. It was delicious and I made a salad out of the leftover salmon, arugula, baby kale, red and green peppers, cherry tomatoes and hard boiled egg for my husband's dinner (he teaches on Tues/Thur eves) tonight. Of course I had to make more of the caramel sauce for the salad…..YUM! Thanks! That looks delicious! I love banh mis! I will definitely have to try it with salmon. Thanks for sharing! This was so delicious! Made it tonight. I put 2 jalapenos diced instead of the birds eye chili into the salmon. The sauce on the fish really makes this dish! I also substituted apple cider vinegar instead of distilled white vinegar for the pickled radish/carrots.